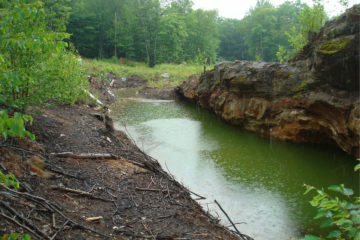 The Elizabeth Mine Superfund site remediation project has received the Green Dream Team Award as part of the 2014 United States Army Corps of Engineers (USACE) Sustainability Team Award program. The award was presented at the USACE Senior Leadership Conference in August of 2014. The Green Dream Team Award recognizes interagency teams for extraordinary leadership in sustainability. Located in South Strafford, VT, Elizabeth Mine was an abandoned copper and iron-sulfate mine that ceased operations in 1958. The $20 million remediation project involved the removal of hazardous waste that had developed during the mine’s more than 150-year lifespan. The New England District USACE teamed with the U.S. Environmental Protection Agency and a consultant team including Nobis Engineering, Inc., to remediate the 43-acre site, a project which was completed ahead of schedule and more than $600,000 under budget. Nobis Engineering has been involved with the project since 2011; we were awarded the American Council of Engineering Companies/Vermont Section 2013 Engineering Excellence Award. More information about Nobis’ services on the project may be found here. Detailed information about the award may be found here.